Integral Powertrain Ltd is delighted to announce that it will be showcasing its use of Dassault Systèmes 3DEXPERIENCE platform at this year’s UK Intelligent Engineering Forum (UKIEF) taking place at the MTC in Coventry on the 5th April 2017. The UKIEF represents a unique opportunity to peek under the covers of a well respected powertrain systems and services company. Members of the Integral Powertrain team will be on-hand to illustrate, on a live PLM system, an entire business process from receipt of specification requirements to manufacturing of finished product. It’s a great opportunity to dive into the design, simulation, development and manufacturing elements of the business. Delegates will have the chance to view in real time how the processes interact and are effectively managed with the latest dash boarding and project management tools on the 3DEXPERIENCE platform. This annual event and networking forum was created by Intrinsys Ltd and its technology partners to provide UK engineering companies with the support and connections they need to maintain a competitive edge using the unique features of the Dassault Systèmes 3DEXPERIENCE platform. Maintaining business success in an environment stimulated by disruptive technology and innovative business models is going to be challenging. The day presents: senior strategists, latest technology and process management, user experiences and networking that will help delegates make the critical decisions for their business over the next five years and beyond. The Forum will also help to address the significant market trends (Industry 4.0, Additive Manufacturing, Big Data etc.) by bringing the right technologies and knowledgeable people together within an environment that’s ideal to explore and build your own Intelligent Engineering systems. 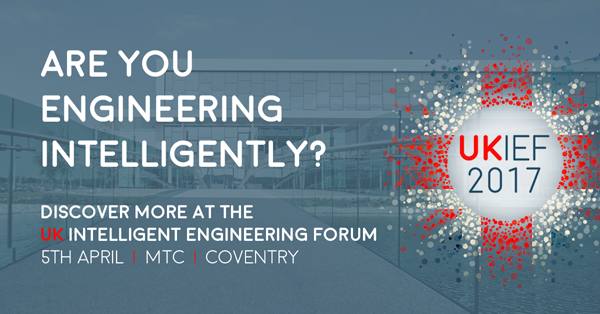 Enhance your Intelligent Engineering systems and processes at the UK Intelligent Engineering Forum (UKIEF), 5th April 2017 at the MTC, Conference & Training Centre in Coventry. Register for free today at UKIEF.ORG.